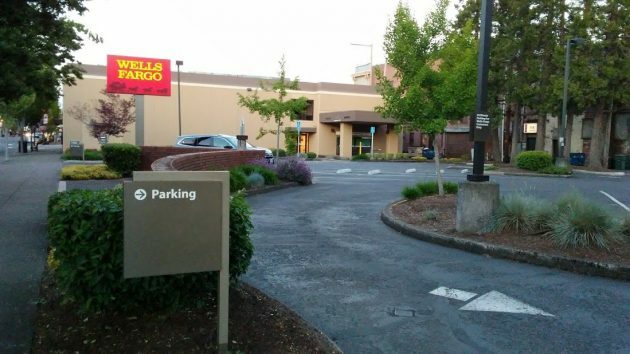 The parking lot of the Wells Fargo branch on First Avenue may be of interest to CARA, or it may not. Rumors that Wells Fargo was about to close its downtown Albany branch had been circulating for weeks before the bank confirmed them Monday. The downtown urban renewal board will hold a closed-to-the-public meeting Wednesday to consider real estate transactions, and the idea of buying the building for its parking may well come up. The closing is no surprise to customers who would usually find themselves alone, except for one or two employees, in the building’s cavernous ground-floor space. It appears to be the result of banks pushing their account holders to do more of their transactions online. The advisory board of CARA, the Central Albany Revitalization Area, scheduled an executive session as part of its monthly meeting, which starts at 5:15 Wednesday at City Hall. The reason for excluding the public from part of it, as allowed by state law, is to “conduct deliberations with persons designated by the governing body to negotiate real property transactions,” in the words of a guidebook by the League of Oregon Cities. I don’t know which property the deliberations are supposed to be about. But according to the league’s guidelines, for an executive session to be legal, the deliberations have to be about specific properties. “The executive session may not be used as a general discussion of a city’s long-term property needs or goals,” the league tells its members. Another possible candidate for CARA discussions: The Eagles lodge building on Water and Broadalbin, which is listed for sale with an asking price of $950,000. There has been a bank at this corner since the First National Bank was built around 1916. But the building used to be taller. Postcript: Reader Cordell Post was going trough some stuff when he came across a clipping from the Sept. 1, 1973, edition of the Albany Democrat-Herald. It reported on the removal of the top floors of the building, then about to begin, and the remodeling of the rest. The remodeled building was designed by Dave Costa, an Albany architect. I guess this isn’t a big surprise. Like newspapers and land line telephones it seems that everything is going wireless and paperless. Banks will use kiosks for transactions that can’t be done online and the rest will be done at a few hubs. Eventually it all goes people-less. The city should consider buying it for parking. 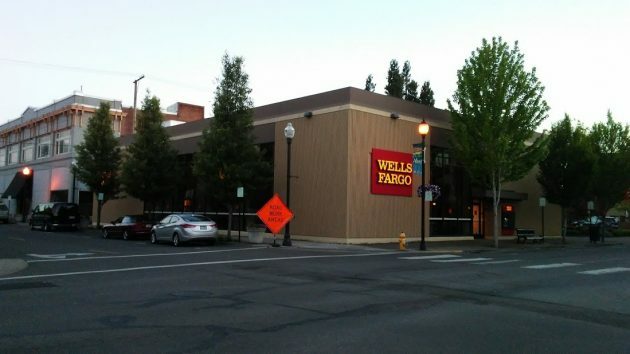 Wells is not a favorite institution of mine however there still are several banks in the downtown core to choose from. 12 PM is noon. It use to be a beautiful building before the top floors were knocked off and the rest remodeled. Numerous banks did atrocious things to downtown Albany in the 60s and 70s. I hope CARA buys the property. It would make for practical parking for the St. Francis, which would be one stop closer to much needed restoration. In addition to online banking, and not mentioned in their news release, is the loss of trust of the Wells Fargo customer base over its recent “slamming” incidents. Customers simply fled to other banks. “If you can’t trust your banker, who can you trust?” This accelerated their demise, as it would any other business in the private for profit sector. Right, Wells Fargo’s actions were really unforgivable. Downtown has really hit a low. The streets are terrible. The lights strung across 2nd and 3rd streets look awful. If I did not need to go downtown everyday to get the mail I would not go anymore. Need a chiropractor visit everytime you drive downtown. Sad part is I do not get to vote on anything in Albany as I live just out of town. “12 p.m.” and “12 a.m.” at least cause cognitive hesitation. “Noon” and “midnight,” with or without the “12,” are immediately clear. An insignificant opinion hardly worth mentioning. But, what’s worth a big groan is that, once again, we see evidence of the extent to which we’re enslaved to auto-centrism (private-car-dependency, just in case I’m not clear enough). We want the bank building for its parking lot. We need a parking lot to restore a hotel. Or maybe we should spend a fortune to buy an ugly building to tear down for parking. Our current relationship with private cars is grotesquely and increasingly expensive, directly due to maintenance and land costs, and indirectly due to loss of “highest and best use” and high healthcare costs from car-induced inactivity. What’s the attitude here recently? Condemnation of a trivial tax to help pay for street maintenance (I hope I’m wrong but I suspect the tax vote will fail today). And complaint about fixing a dangerous road because it might encourage alternatives. Groan. They should close all their banks…they are ripping people off with their fake charges on car loans. Took my car last week that I have been paying on for 3 years. The repo company told me they have 25,000 cars they are taking. It took him 3 weeks to get to me and it’s all from Wells Fargo bank. Glad to hear they are getting fined! Should go to jail for what they have done to people. If they are going to use it for parking, they should build a parking garage that looks like a building. Maybe put some storefronts up as part of it. In my opinion, nothing blights a downtown area more than open asphalt. I’ve lived in many different places, and the downtown areas which filled in their open lots with storefronts, greenspace, and parking garages (which are built in a similar style of surrounding buildings) always looked nicer and had good foot traffic. The ones with a lot of open parking lots never seemed as alive to me, just didn’t get as much foot traffic. Of course this is just my opinion, but I always felt the more connected you make all of the buildings the more people will enjoy walking around downtown.